Well, it's not the most momentous announcement, but I've finally gotten off my big, fat... procrastination muscle and gotten a hold of Mark Hellman, my "voice guy". We've only arranged one session for next Wednesday, just to see where I'm at for now. I think it's important to do that, given that, after my dental surgery a while back, I essentially have a whole new mouth than when I last worked with him. Now, I just need to think of a project of some sort to actually work towards. Hmm. In other news, Lynn is away on Saltspring Island this weekend with her scooter group. They go there every June and two-wheeledly explore and wander. This means she can't update her blog herself, so I've been adding some placeholders on her behalf. So, basically, that means parties and strippers here all weekend. And if you believe that last sentence even the slightest bit, you've obviously never met me. So, I've just blogged in my blog about blogging in someone else's blog on their behalf. Is there such a thing as a "meta-blog"? Because I think I've just hit one. Posted by Doug A Scott at 10:48 p.m. I just watched Blink last night. 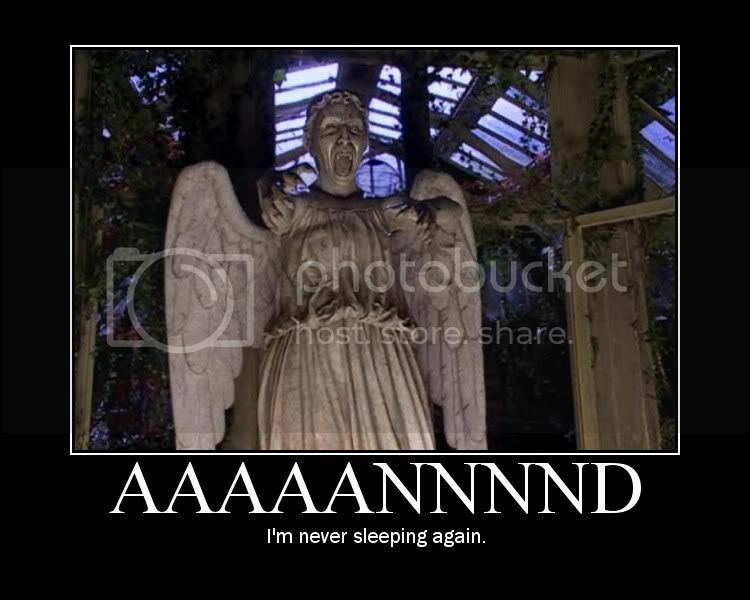 I think I may have developed a lifelong fear of statues. June 10, 2007 at 10:52 p.m.
Let me try that again, this time with link tags. June 11, 2007 at 4:18 a.m.
We also watched Blink just last night (I wanted to wait until Lynn was back from her trip to see it). That was pretty damn creepy. And it had that wibbly-wobbly timey-wimey stuff that I love in a time-travel story. June 11, 2007 at 11:51 a.m.